This is a really cost-effective way of upgrading your existing casement windows, without splashing out on expensive replacements. Many old casement windows have suffered because of a breakdown of the animal glues used during construction – making them more susceptible to fungal and insect attack. We can repair these using modern adhesives that have a much longer shelf life, as well as carrying out the other repairs that restore your windows to their original high quality. 1. 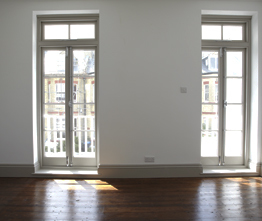 We realign the window frames, ensuring that they open and close in the smoothest possible way. 2. Similarly, we service each of the hinges to make operation easier. 3. The window furniture is all serviced to ensure correct alignment. 4. The necessary timber parts are replaced with exact match, sustainable wood. 5. We cut a special groove for the brush into the edges of each casement. 6. And finally, we re-fix casements to the original frame.